Just a silly little test of the scripting system to tell a cheesy low-brow sci-fi story. And it sure looks lovely! WOW! That was pretty creative! I liked the "Showers" room. That was an interesting use of text! Also, your scripting is very excellent. Didn't find a SINGLE bug. Trinkets would have been fun, though, but I liked the level a lot! I was hoping that you would find the original captain eventually, but that was still quite entertaining! Excellent work! 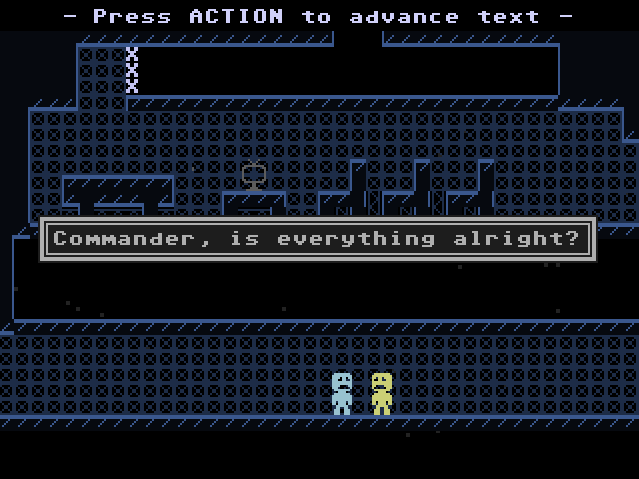 This is now my favourite VVVVVV level. Wow! This level is awesome! This is chiefly because of the story, which is both amusing at first, and even slightly creepy later; the captain's log part is VERY well written! Reminded me a bit of one of those sci-fi horror movies I've seen so much of, like "The Thing". I liked the room design a lot too, especially the "Shower" room - it reminds me a bit of what I'm doing graphically in the level I'm working on. I hope nobody makes a big level with that kind of design aspect or they'll overshadow me! This level's really short and sweet though. Nothing difficult about this level, obviously. It's a really great example of a story level. You totally deserved to get featured. Nice work!